I have made an easy arrangement of the popular song Morning Has Broken for late elementary level with complete fingerings and chord symbols for accompanying instruments. 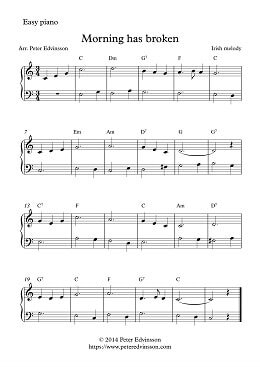 This version is written in C-major and can be downloaded in PDF format! Cat Stevens included a version on his 1971 album Teaser and the Firecat. The song became identified with Stevens because of the popularity of the song. 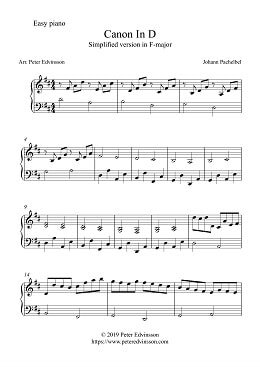 My version of Canon in D by Pachelbel is simplified and printable in PDF format. It is very common at weddings to walk down the aisle to Canon in D and subsequently it is a very popular Google search. The sun is gone but we know it is still there. The impact of the sun is understood and felt by everyone. Early intermediate piano composition in the style of Chopin.